What was the last flashlight you used and what was it used for? Re: What was the last flashlight you used and what was it used for? Spent a week in the Eiffel with the missus. The path to the restaurant was a bit dim lit. So I used the Thorfire VG10 I bought for less than €12 at a sale on Amazon. And now it is my favorite EDC light. I always think long and hard before I say something very stupid. I used my brightest light (Malkoff Wildcat V6.) to scan the yards for a skunk, before I let the dog out. I don't want her to have ANOTHER encounter with the "stinky kitty." I used a flashlight to take pictures of flashlights. Nitecore TIP for walking back to the car after staying out too long on the trail during a day hike. Ummm just got it so I just shined it into my back yard and up into the trees and I heard some passers by say WTF was that (they didn't see me). Being its late, I just turned it off and went inside LOL. Its now very old tech / old school but got this Coast HP21 for cheap so wanted to test it out. Later I used my 10D BrightStar to turn off the neighbor 3 doors downs' light sensing porch light. That 4-1/2" mirror shiney reflector throws the beam of a #258 bulb like it was shot out of a bazooka. LOL! That's awesome. You don't see many folks using ROP mags these days. Certainly something I'd like to add to my collection one day even if the newest LED throwers can top them. How far can it legitimately reach out? I have a TN42 that can reach out a legit mile. Since that one I have little need for another thrower but an ROP mags sure would be fun to play with. Johnny, I do not know the distance vs cd and all that. I can say that last summer while walking along the shore of a river bank at a dark campground on a cloudy night it was shining as far as the gasoline powered golf cart headlights that kept whizzing by me. I lucked up and acquired an old school one with a custom made reflector (before those kadomains arrived), a clear glass borofloat, an upgraded switch assembly and a copper braid in the tailcap section. It has a lanyard ring/spacer to add a wee bit of length to the body so the tailcap closes down proper using 2 high ouptput 18650's inside a (Mag 2C) Delrin sleeve. The seller included 4 twin packs of hi/lo bulbs as well. The crazy part? $65 shipped. I couldn't have built it for that. Heck 4 packs of bulbs (if you can find them) would be nearly that much these days. I did some Mag ML25 IT incans with currently available stuff in an effort to keep them stock. Using a 2C platform with a 'natural gas' sized 3/4" section of pipe, a pair of gentle LifePo4 18500 solar light batteries and a 4 cell bi-pin gets about 200 lumens with no melting of the stock parts. So I did a 3C version with a pair of 1amp 18650's, same pipe and a Streamlight TL3 bulb. I cut off 1-1/3 coils of the spring to relieve the pressure on the batteries. That one melts the stock reflector ever-so-slightly near the bulb. I did a full size 2C same as the 2C ML25 and it works great. With the larger reflector it throws well. The stock lens was for a krypton so there is a nice gap between the bi-pin and the lens. (Read: no melting). Oh, in the ML's I use the slightly diffused acrylite lenses Chris started making for ML's at flash light lens dot com for a super nice, artifact free beam with no loss in output. One day I asked him if he'd make me some glass for the new ML25's. He responded "you betcha" and added those sized lenses to his lineup. He sent me some acrylites while the glass was being made. Super nice for cool running lights, and using in 15 or so minute intervals have held up well in my hotwire'd ML25's. In my 3C ML the reflector melted near the bulb a bit but the lens is fine. Alright, I'm way off topic, so btt... Today I used my PK Design Lab PR-1 on low, at a right angle near the floor to cause a shadow from the tiny screw I dropped while fixing the wife's eyeglasses. Lately I'm working at night observing asphalt paving on a wagon trail that was discovered by civilization and is now a shortcut from Yupi-topia to the confines of their inner suburbian cubicle laden offices. Tonight it was very foggy. Lately my trusty Coast HP7 and it's slightly blue tint beam has provided the correct tint for given situations where CRI is irrelevant, yet illumination of textures and flaws in the mat is a daunting experience with most of my flashlights. Being it is a zoomy it provides a spread of light, a pencil beam or somewhere in between as situations dictate. 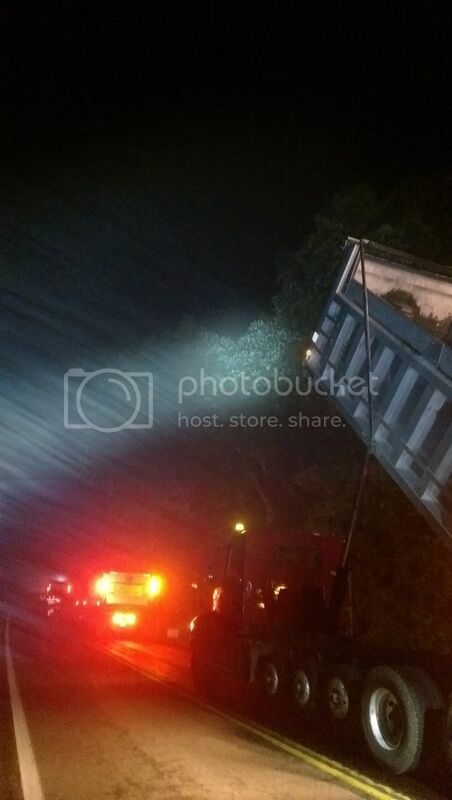 In the thick fog a pencil beam was drilling a hole through the moisture to ID trees and wires in great detail so the trucks that deliver the asphalt to the job can raise a bed and know when to lower it before they rip something overhead down. Floody lights or broad beam'd lights blind us in this dense fog as all of that moisture is lit up. In the photo a truck approaches a famous old maple tree at a famous old church (circa 1808) that if damaged would have us all doing some explaining. Used my XTAR RC2 Moon floodlight to light up the socket number on a phone line outlet on the wall behind some office furniture at work. 9x led Skyray King. 4 x 18650.
great for walking out on rear deck and checking pool water level b4 bedding down. We live in tropics. and last 3 days over 40 deg, c. it drops around 2 in per day. I use one of 3 No-Name pen torches. $9.72 del, for 3. Wife has one in handbag. T'other in drawer as spare.Self powered. internal rechargable. First one near 2 yr old. used nightle. several times. Plug in Micro SD once a week. Purrrrfect for job. Leaves all the other "real" torches for ded. 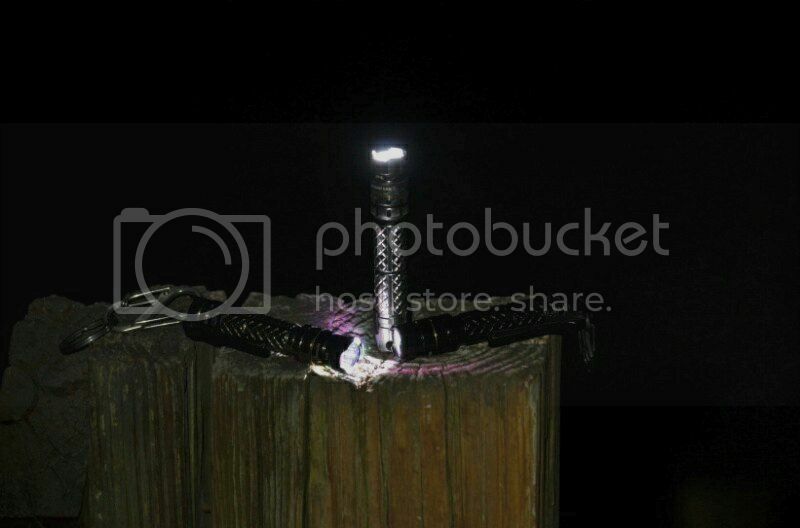 Thorfire TK18 was used to illuminate wire markers inside a switchgear structure.